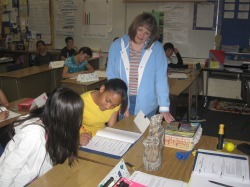 I am available for author visits to your school or organization. To schedule an author visit, e-mail me at caroljamato@earthlink.net. For a complete school visit packet, please e-mail Robin Kelly at Stargazer Publishing Company at robinkelly@stargazerpub.com. Below are some photos from some of my more recent school visits. Both Columbus Middle School and I were the lucky winners of the school visit raffled off by the California Readers Association at their annual luncheon in Burbank. I presented a slide show about the Navajo Nation to two assemblies. 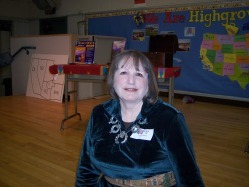 Here I am dressed as a Navajo woman to present "All About the Navajos" to the students at Giano Intermediate School in West Covina, California. 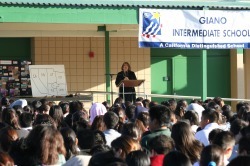 In the morning, I spoke to the entire student body. 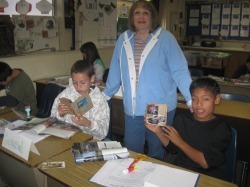 Then I went to all the English classes to show the kids artifacts from the Navajo culture. It was a very fun day! I'm showing the kids a sand painting. 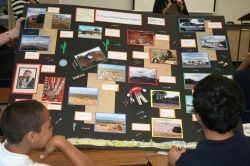 The kids look at the photo board I brought showing pictures from one of my trips to the Navajo Nation. 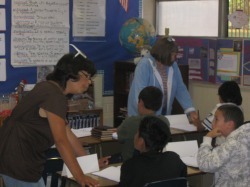 Maria Toth, a fellow writer, and I taught "So You Want to Write Short Stories," an 8-week creative writing course, in April and May, 2009, to twenty-five 4th, 5th, and 6th grade GATE students at Haynes Intermediate School. The short stories were published in a book. 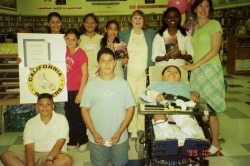 Each child got a copy and one was placed in the school library. This course was great fun! I'm helping two of the girls with their story ideas as they write in their workbooks. Maria and I clown around with two of the girls. I'm helping two of the boys with their paper bag albums, a creativity sparker for their story ideas. Yair Garcia gets ready to read his story to the class during the critique session. 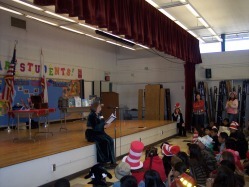 For Read Across America Day at Highgrove, I read from The Lost Treasure of the Golden Sun at an assembly for 3rd and 4th graders. 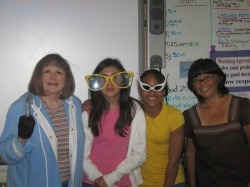 Maria Toth and I also talked about "A Writer's Life" at a 5th and 6th grade assembly. I'm wearing my Navajo costume. Taking a break between assemblies. 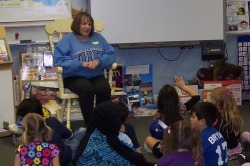 Here I am talking to a kindergarten class about being a writer. And here I am talking to another kindergarten class about the Navajos.